For those that either know or don't know, I really don't get to downtown Tucson very often. It's like, I'm not against the whole downtown saturation thing with the hipster spots, "you just have to try this" dishes, locally famous chefs perfectly cooking eggs and putting them on, well, everything and the rotten parking - I'm just more of a, well, everywhere else in Tucson kind of guy. 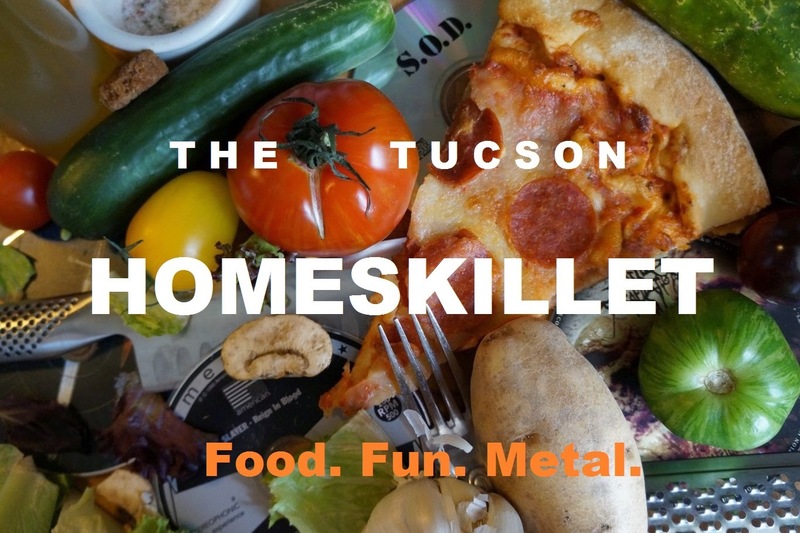 I think the Tucson Homeskillet is great like that; let's find the bits and bobs of neighborhood funk that you might have missed as you were driving towards Congress street to eat a ten dollar slice of pizza. But when I heard local kids done good behind Pueblo Vida brewing finally found a spot nestled between an abandoned store front and popular cafe, I sighed deeply, I gently rolled my eyes and proclaimed, "Oh, okay. Let's go downtown. I guess..."
The first time I heard about Pueblo Vida was through my better half. She-Ra told me that some young upstarts were sitting at her bar, talking about opening up a brewery and seemed like they knew what they were doing and she liked what they were saying. Then they stopped coming to her bar on a regular basis only to find out that they successfully opened in a cozy spot downtown Tucson on Broadway. Good for them but She-Ra rather missed them sitting there and discussing their beer brewing dreams and aspirations. "The concept of Pueblo Vida when Kyle and I graduated from U of A," said general manager Linette Antillon, speaking about her and brew master Kyle Jefferson on a warm mid week afternoon in their brewery. "We graduated during a time when no one was hiring, so it was up to us to create our future. Kyle was raised in Washington state where craft beer is abundant and introduced me to different beer styles I didn’t even realize existed. Within a year we had moved our lives to the Seattle area where Kyle started an internship at Lazy Boy Brewing and was able to learn the commercial microbrewery business. 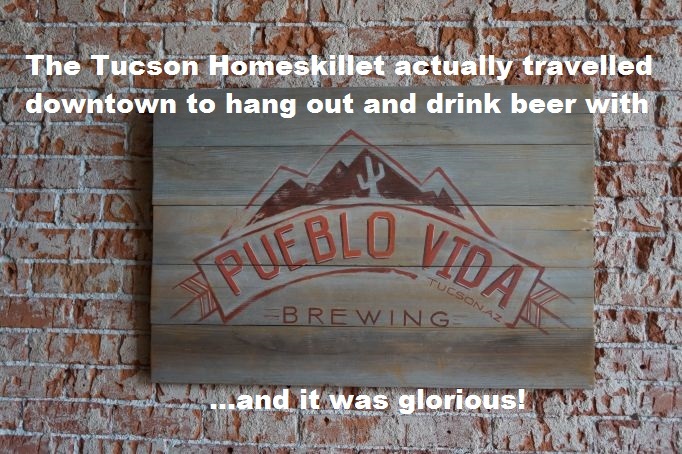 The idea was always to come back to Tucson to start our brewery, which is our home. Also, we saw a big need for more breweries here that we could fill because when we left there were only three breweries in Tucson. It took us about 5 years from idea concept to doors opening, and worth the entire ride." When I finally had a chance to sample one of their foamy masterpieces at a local festival, a golden hued IPA called their Northwest, I knew that Tucson had something special on tap. It was a perfect pint of beer, this coming from a certified IPA nut. It was citrus-y with a great hop/malt balance and then I knew I was hooked. It was at that moment of sipping a fantastic frosty glass of ale that I knew I had to feature these kids on the Tucson Homeskillet. It's....it's the least I can do. "Kyle is the microbrew enthusiast", notes Linette as a flight of beer samples is being poured for me. "He started home brewing in college from a kit his father gave him during a holiday present. He had grown up with craft beer, instead of the yellow fizz most of America was drinking, in his parent’s fridge. He felt he could create a product that people would enjoy and introduce people to beer styles that they might not normally find. For me, it was about creating a place that was comfortable and inviting for people to come in and enjoy that beer." And created something grand is just what they did. The brew pub itself is snug with a definite warm atmosphere to it. Think of that awesome uncle you only get to visit once a year, the one who always has the best board games and named his BBQ the 'Grillenium Falcon'; this would be a larger scale of his hangout basement, the one where he let you sip his home brew when your folks were trying to talk to grandma on the land line at Thanksgiving. I then had a sip of their Bavarian Hefeweizen and, wow, let me tell you - how they managed to get such a handle on clove notes then have it finish up with a distinct banana flavor is beyond me. And I don't like fruit beers. But this isn't a fruit beer. It's....something else. It's amazing is what it is. When I asked about why the decided to open up downtown, Linette chimed in with "Tucson is home to Kyle and I, this is where we met and where we want to create our life. We love the community here! Downtown was important to us when we were looking for a location. It was a time when downtown was actually becoming a downtown and we really wanted to be a part in shaping what it would become." That feeling you get when you realize you still have all that beer to drink! Fair enough. For me, like I mentioned earlier, I'm not much of a downtown guy. I like to explore the further reaches of Tucson in search of the weird and wild to eat and drink. In just a few short years, the downtown area has been flushed with hip spots to eat and drink. Too much almost. With this kind of heavy concentration of like-minded businesses in such a tight area, I just hope Pueblo Vida doesn't get snuffed or passed by. Then after drinking their Breakfast Stout, I knew that would not be an option. A mad delicious creamy compliment of coffee and dark chocolate with an easy clean finish is what almost pushed me over the edge with beer soaked glee. Unreal. Let's see. Yes...I'll take the lot! 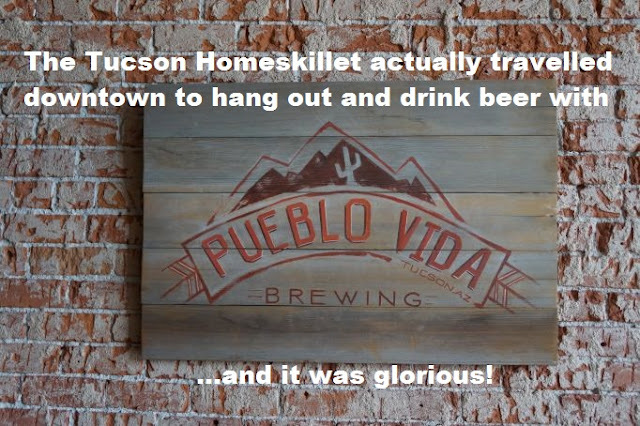 "Pueblo Vida is always buzzing with activity," informs Linette upon the day in the life of the brewery. "Brew days start at about 6-7 a.m. and a typical brew day lasts about eight hours. The tasting room is open seven days a week, so the place only ever stops for a few hours every night. When the brewing crew (Kyle and his assistant brewer LJ) aren’t brewing they are out delivering kegs, washing kegs, etc. We have a staff of 6 or more with Kyle and I that keep the place running." As the new rail car zoomed by and typical traffic on Broadway beeped and screeched, I had a sample of the Belgian Saison. First to grab the tongue was a distinct lemon zest zing with some spice such as coriander on the flavor caboose. It was nice and dry but not too dry and as the world spun outside their front entrance doors in the white heat sun, all I could do was smile wide as the heady beer fuzzies you get from consuming real craft ale began to take hold. It then occurred to me that I have had Pueblo Vida beer, outside of the tasting room here and that random festival. Yeah, while waiting for tacos at BK (again, not Burger King for those outside of the 520 area code) I had their Arizona Common, which was like a Corona if Corona gave a crap and grew mas cajones and was like your badass big sister who would beat up the bullies that sullied your face then watched Bruce Lee movies with you till the ouchies went away. When the food arrived I kind of didn't care. I wanted another round. But when She-Ra texted "Where you at...I want TACOS!" I knew I had to high tail it out of there and promise to return another day for another pint. I call this "Landscape of Oh Hellz Yeah!" "We have a few beers we brew consistently," says Linette when I ask about their 'signature' beers they produce and are in demand. "I'd say the Bavarian Hefeweizen, Northwest IPA, and a stout (American Stout in the winter & Breakfast Stout the rest of the year) are always in the mix . We started out with these three to offer people a variety and they were very well received so we’ve kept brewing them. We do keep about four other seasonal beers on tap that constantly rotate and are in demand." Growlers and trophies; everyone is a winner! It was here that I spotted an award for Best IPA in Show and just had to have another sample. She poured a half pint of the Double IPA and my knees buckled along with my taste buds after sipping it. It was so crazy juicy with a distinct piney conclusion that all I could do was agree with every judge on that panel, even if this wasn't the IPA that garnered them a trophy. It didn't matter. I was too blissful to even ask. When I told her about discovering Pueblo Vida beer at BK, Linette then informed me about all of the other places you can find their handiwork. "We have about 20 accounts we are currently delivering to," she said. "We only really deliver the Bavarian Hefeweizen but we do have a few accounts we give rotating seasonal beers to. Some of our clients include Proper, Diablo Burger, Roadhouse Cinemas, Frog & Firkin’, Saguaro Corners, Ermanos, Tap & Bottle and the list is growing all the time." "The highs? ", muses Linette when I ask her about the ups and downs of operating a microbrew in Tucson. "It’s a fun industry, I mean we sell beer! The community has been amazing to us and welcomed us with open arms, for which we can’t be thankful enough! It’s been amazing and we can’t wait to continue serving this amazing community in such a wonderful industry. "The lows...I would have to say is that we can’t brew enough beer fast enough. 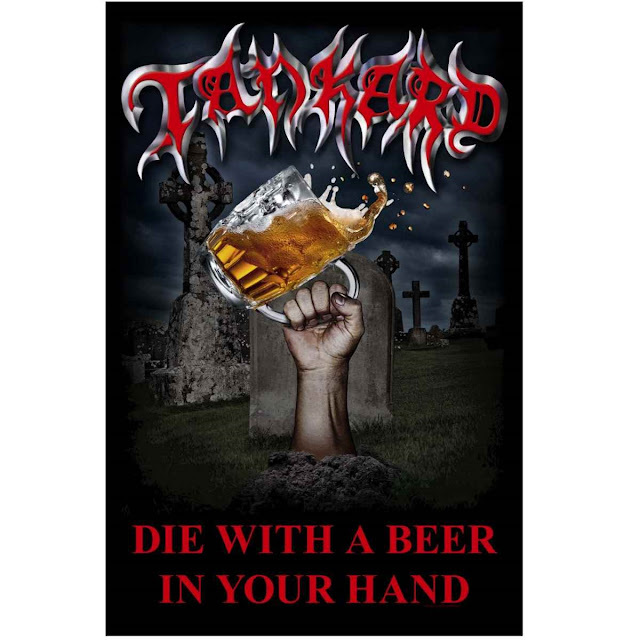 We have had to turn down accounts, ones in which we would love to have our beer in, because we can’t keep up with our current size. It's frustrating but we can only handle so much right now." As the beer flight was all but consumed and my head was swimming in a golden hued euphoria, I just had to know what is in store for Pueblo Vida in the immediate future. "We are currently expanding into the space next door," points Linette to the adjoined empty store front. "It will give us a bit more room for brewing and some more seating, both of which we really need. We will also be adding a private room to host small private parties of about ten to fifteen people and a very small barrel room to start our barrel aging program. We recently purchased barrels from Hamilton Distillers and are excited about aging some beer in those fragrant whiskey barrels. "Mostly though, our plans for the future is to keep creating great craft beer that people can enjoy!" Enjoy is such a small word as I exited into the bustling street outside of the sequestered beer haven I was privy to the last hour or so. Relish, maybe is a good adjective. Cherish, perhaps? Adore, even? Thing is, the kids at Pueblo Vida know what they are doing and are doing it correctly and for that I applaud their efforts and their beer brewing point of view. Now, I've had my fill of amazing microbrew beers (trust me here!) but the Pueblo Vida creations I was lucky to have drank on their premises and while waiting for tacos was some of the best I have quaffed in quite some time. I am confident your experience will be the same. So get yourself to their location downtown or at any of the fine establishments they are featured in across the Old Pueblo and see for yourself. "Die with a Beer in your Hand"